OlliOlli (PS4) Review - This Is My Joystick! I loved the Tony Hawk’s Pro Skater franchise when it was at its prime a couple of console generations ago. Sadly it waned as time went on, I lost interest (as did everyone else), and I haven’t played a skateboarding game since. 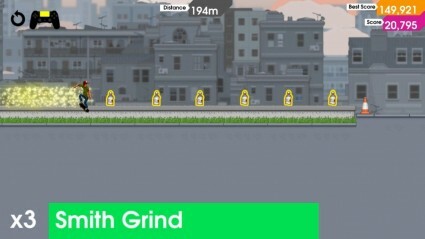 That is until I picked up OlliOlli, a charming indie take on riding virtual wheeled 2×4 plank death machines. OlliOlli won’t scratch any nostalgic itches for those yearning for a Tony Hawk’s reboot – not that it tries to – but it does offer a completely different experience that’s as addictive as it is punishing. After initially launching on Vita, it’s now done a 180 over to both the PlayStation 3 and 4, and I’ve been spending time with the latter. It’s interesting to consider how a real-life sport can be translated into a video-game. More often than not the simulation route is taken, attempting to recreate the activity as faithfully as possible in a 3D space with realistic graphics and mechanics. OlliOlli instead strips away skateboarding to its simplest core concepts and places it on a 2D plane. What has the potential to feel like nothing more than a caricature of the sport actually manages to capture its essence quite effectively, however; and this is achieved through its control method. Rather than simply map jumping to a button, OlliOlli has you pulling down on the analogue stick to simulate bracing your body, followed by flicking up to launch into the air. Depending on how you flick or turn the analogue, you’ll perform different tricks. You can’t even let your skater return to the ground on its own, as you’ll need to tap X at just the right time to descend smoothly, lest you perform a sloppy landing and ruin your score. Grinds are performed by flicking the analogue once more at just the right time as you contact a rail, and a perfect timing here increases the points that you’re awarded. You’re ill? Oh, I get it. You kids and your lingo. The end result is a series of very tactile input mechanics that require a lot of coordination and timing. Initially you’ll struggle to pull tricks off without bailing, and it gives you some appreciation for the dexterity and control needed to skateboard in real life. Now don’t get me wrong, OlliOlli doesn’t make you feel like you’re really skateboarding, as no standard controller can do that. A past attempt to better emulate the sport was the skateboard peripheral included with the ill-fated Tony Hawk’s Shred, a complete flop which drove the final nail into the series’ coffin. The less said about that the better. Instead, what we have here is something that merely helps to convey the spirit and principles of the sport. 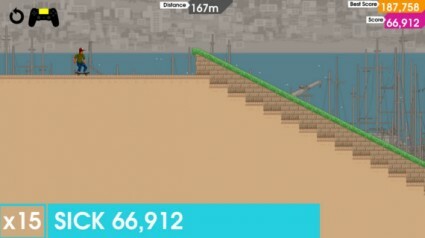 Levels are super-short, minute-long affairs, taking you from point A to point B with no stopping. In this respect it draws some parallels with Rayman Jungle Run, being similar in format to an endless runner… but actually ending. One of the only ways in which it bears resemblance to Tony Hawk’s Pro Skater, on the hand, is the mission objectives. Alongside an overall score and combo score to beat for each level, it gives you a myriad of challenges ranging from pulling off certain tricks to collecting items in hard-to-reach places. Considering that most of the levels are a cakewalk to simply reach the end of, nailing all of the challenges will form the bread and butter of what you spend your time on throughout the game. Some objectives are a cinch and you’ll probably achieve them by accident, whereas others are a lot trickier and will have you hammering the restart button over and over. Perhaps with the odd exceptions in the later levels, it shouldn’t take too long to finish most of the initial objectives. Completing a level in its entirety unlocks the tougher ‘Pro’ variant, however; and if you beat all of these you’ll be faced with the gruelling ‘Rad’ levels. Objective 4: Collect the thingies! Each stage is meticulously constructed to facilitate some fantastic combos. As all of the techniques drop into place and get assimilated by your muscle memory, you’ll find yourself effortlessly chaining grinds on rails, benches, seaside stalls and even tanks, as you flip and spin in between. Sadly the roster of skateboarding tricks is a little under-represented, with no grabs or manuals. It’s also unclear why you should choose one trick over the other, so you’ll most likely be arbitrarily flicking the analogue stick in random directions as opposed to putting much thought into it. Nonetheless, skating your way through levels is fluid and engaging. The regular sliding and flicking motions almost feel rhythmic, which punctuates what is a surprisingly stellar soundtrack. It’s a fusion of dance, hip hop, rock and even jazz, lending OlliOlli a wonderful sense of urbanity. In fact, the music is a far stronger representation of character than the visuals – these are stylish enough but ultimately a little soulless. It also doesn’t feel like the Playstation 4’s extra grunt has been utilised to the fullest, appearing for the most part as simply a blown-up version of the Vita original. This is particularly evident in the rough, slightly pixelated protagonist and the sometimes stilted animations it produces. Perhaps the only real disappointment with this Playstation 4 (and 3) port is that there have been few noticeable changes or enhancements – but this isn’t necessarily a bad thing. If you’re not an owner of the criminally underrated Vita handheld console then here’s your opportunity to dive into OlliOlli, whereas fans of its portable iteration will now be able to flip, leap and grind on the big screen for free, courtesy of Cross-Buy and Cross-Save. With that in mind there’s very little to complain about here – whatever your platform of choice, you’re in for a slick, arcadey skateboarding treat.